With October’s financial markets swoon firmly in the rear-view mirror, the U.S.’s lights are once again shining most brightly after the Bank of Japan gave markets a big Halloween treat—or will that prove to be a trick? Just as markets were about done digesting the Fed’s upgrade of the U.S. economy and end to quantitative easing (QE), the BoJ went all-in. 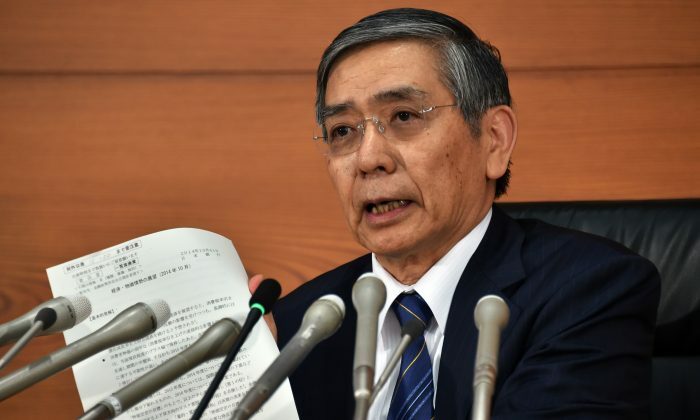 The Japanese central bank announced it would be essentially buying up all net debt issuance by its government. This is an unprecedented move by a central bank of an advanced economy in recent years and has many a market observer lamenting that it will likely end in disaster. The aim of the move is for Japan to reach the “holy grail” of the 2 percent inflation target. Consider a couple of ramifications: Japan’s public pension fund (GPIF) will now appreciably ramp up its allocation to equities and downsize its allocation to bonds. Needless to say, this goes against conventional retirement planning. And we’re talking about Japan, a country with the fastest-aging population in the world. Also, the Japanese government bond (JGB) market is unable to do what a bond market should since there is no proper balance of buyers and sellers. It is unable to convey the market’s interpretation of economic data, policy, and stress. Of course, this is nothing new. The Japanese yen depreciated to its lowest level in seven years and the 10-year JGB hit an all-time-low closing yield of 0.444 percent on Nov. 4. The S&P 500 finished up 2.3 percent in October, at a then-record closing level on Oct. 31, helped by the BoJ move. October was plenty volatile; the index was down 5.6 percent and rose 7.9 percent from that low. Also helping U.S. stocks are corporate earnings, which are on track to grow by 8 percent with just over 80 percent of companies having reported by Nov. 4, based on analysis from FactSet. This is better than the 4.5 percent that was expected at the start of earnings season. The dollar index is at its highest level since 2010 and the Canadian dollar is trading at five-year lows. Over the observation period, Canadian government bonds outperformed U.S. Treasury bonds noticeably. While most of the price action took place shortly after the BoJ’s move, the wait for the next potential market moving events is not going to be long. With weak inflation readings in Europe continuing and the European Commission revising downward its GDP forecasts (0.8 percent for 2014 and 1.1 percent for 2015), the expectation for more action by the European Central Bank is not unwarranted. However, the Nov. 6 ECB meeting isn’t expected to be a blockbuster given the recent actions taken. The Friday U.S. jobs report will be important as always, but there will be no debate about any changes to QE now. St. Louis Federal Reserve Bank president James Bullard, who recently discussed not ending QE in October, now doesn’t see the need for further stimulus. The jobs report is all about tracking the healing of the labor market and the timing of the first rate hike. Brent crude and West Texas Intermediate oil prices fell to four- and three-year lows respectively on the day Saudi Arabia announced price cuts to the U.S. The trend lower doesn’t seem to be abating and with WTI below $80, if it persists for an extended time, should cause some capital expenditure changes in the energy space. Also, low oil prices will feed into inflation, keeping it low. For now, the U.S. is not being held back as Europe, Japan, and China struggle. Japan’s additional stimulus has blunted the impact of a more hawkish Fed for the time being. Rahul Vaidyanath is a Chartered Financial Analyst (CFA) with 15 years of capital markets experience. He has worked in the Financial Markets Department at the Bank of Canada and as a mortgage bond trader in the U.S. Follow him on Twitter @RV_ETBiz.